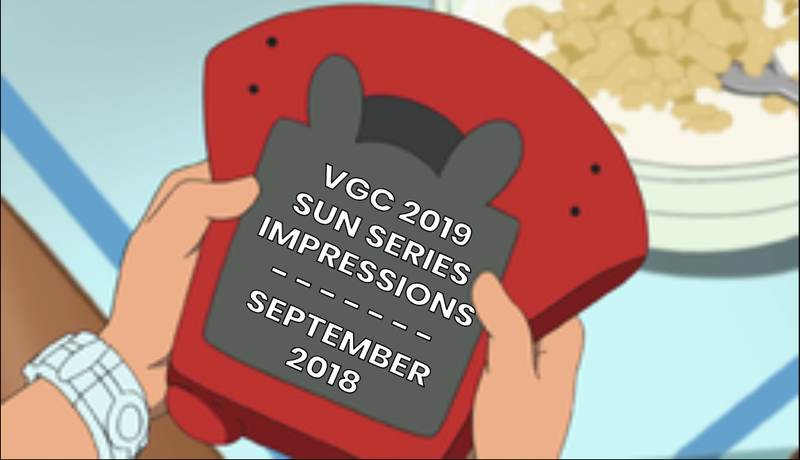 The first month of a VGC season is a very hectic and eventful month for the VGC 2019 Sun Series. This article will look at the events of the major events that took place during September 2018 so we can look at where the metagame is at this month an where it is heading as well for the future. Incineroar is currently having another amazing VGC season. 31/32 or 96% of players in Top 32 at the Philadelphia Regionals, #1 on VGCStats with over 7000 CP earned at events recorded, and 29/32 or 90% of players in Top 32 at the Frankfurt Regionals. When the knowledge from Philadelphia Regionals was spread through the VGC community, a lot of players had very interesting reactions as noted by a tweet and the responses to it from Tommy Cooleen (@TmanVGC). Most players seem to be of the opinion that this is due to how easy it is to fit Incineroar onto teams. It's a Pokémon that provides tools to teams that every team can use, mainly a Fake Out and Intimidate user that doesn't get destroyed by Xerneas, unlike Scrafty and Hitmontop. Unlike other Pokémon that have been ranked #1 in usage in past seasons like Mega Kangaskhan and Smeargle, most teams are naturally built with Pokémon that can hit it either for super-effective or for a large amount of damage with neutral hits through your 2 Restricted slots. This was very much true in VGC 2016 despite not winning at the World Championships and its true so far in the 2019 Sun Series. At Philadelphia Regionals, it was the most popular core with 12/32 or 37% of players using it and at Frankfurt Regionals, 17/32 or 53% of the players used the core and what's notable is the players that finished 2nd through 8th all used the core. The strength of this core is simply how its able to offensively pin most Pokémon as the combination of Groudon's Precipice Blades and Xerneas' boosted Dazzling Gleam can either KO a Pokémon or heavily damage them. Certain Pokémon have already started to pop up that can do well against this duo like Ho-Oh which can easily take their hits very easily, and Venusaur which can hit them for super-effective damage with Grass Knot for Groudon and Sludge Bomb for Xerneas while out speeding thanks to Chlorophyll. Despite not winning a Regional so far, based on the usage statistics, it's only a matter of time before Groudon/Xerneas takes its first Regional title. In formats where restricted legendaries are legal, the Pokémon that support them are generally going to be the most important tools a player has. Toxicroak has seen a resurgence after winning the 2009 World Championships thanks to its Poison typing to defeat Xerneas and its Dry Skin to take Kyogre's Water type moves, as seen by Justin Burns (@JustMrBurns) to win Philadelphia Regionals. Toxicroak didn't receive major success at Frankfurt Regionals with only one finish from Julian Ganser who finished 21st. Venusaur, thanks to its Grass/Poison typing allowing it to hit Kyogre, Groudon, and Xerneas for super-effective damage and its Chlorophyll ability to fire off a fast Sleep Powder under Groudon's Sun, had a breakout tournament run at Philadelphia Regionals when a few players used it to do very well at the Regional: Ashton Cox, Jake Magier, Nick Navarre, and Ian McLaughlin to finish Top 32, Chris Danzo, Robert More, and Jeremy Rodrigues to finish Top 16, Enosh Shachar to finish 6th, and Angel Miranda to finish 3rd. Fast forward to Frankfurt Regionals and Venusaur had 9 more impressive finishes to earn CP: Top 32 from Tobias Koschitzki, Fabian Braun, Nuno Rosário, Fatih Yavan, Tommaso Calzolari, and Harry Louth, 7th place from Bartosz Ekiert, 3rd place from Matthias Suchodolski, and 2nd place from Alessio Yuri Boschetto. The final Pokémon in Tornadus is the most recent Pokémon to win a Regional, used by Matteo Agostini (@UltraMattVGC) to win Frankfurt Regionals. The strength of Tornadus is its Prankster ability which means it was able to support Matteo's Kyogre thanks to the use of Rain Dance to make sure Kyogre always has its rain and also use a 100% accurate Hurricane in said rain. Tornadus is also able to use Taunt to shut down support Pokémon like Bronzong and Smeargle or stop other Pokémon like Venusaur from using Sleep Powder or Xerneas from using Geomancy. While no one knows for certain where the 2019 Sun Series format, there are a few things that will most likely happen. 1 – Groudon + Xerneas will win a Regional before the end of Sun Series. As discussed earlier, this duo has been seen a large uptick in success and can be easily referred to as a Top 3 Restricted duo in this format. At both Sun Series we've had so far this month, its been the most popular core and at Frankfurt, it was in used by the 2nd place through 8th place player. This means that if this trend of popularity and usage continues, it's only a matter of time before Groudon/Xerneas wins its very first Sun Series Regional. 2 – Incineroar will be used by every player who earns CP at Regionals. If this happens, I doubt most players will be surprised by it, but we have gotten insanely close to this happening at Philadelphia Regionals with 31/32 and Frankfurt Regionals with 29/32. Incineroar has become a very strong Pokémon and almost a staple for teams. This means that one day, we will hit a Regional where every single player who earns CP at a Regional has Incineroar on their team. It may happen at only one Regional or even multiple Regionals, but the day will come one day soon. With 2 North American Regional happening in October: Memphis, Tennessee on October 6-7 and Portland, Oregon on October 27-28 no European Regional, only one Special Event for Latin America in Chile on the 21st, and the online Latin American International win-a-trip Challenge on the 20th, we won't know how the format will change, but one thing's for certain is whatever changes happen in the 2019 Sun Series format, you can expect some changes and it will be very interesting to see what happens.